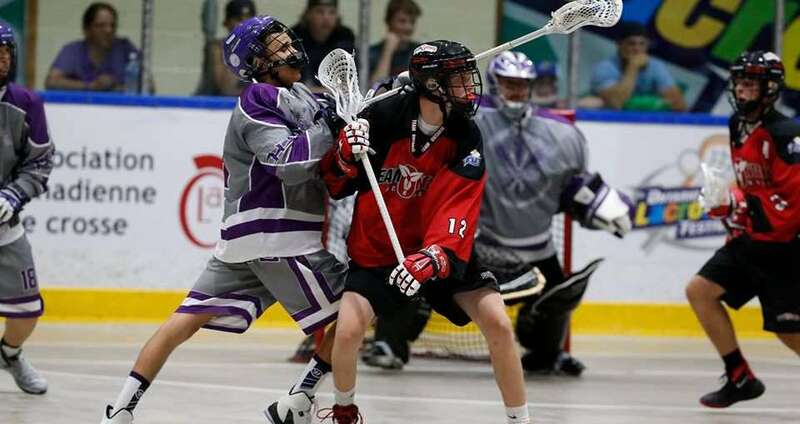 The top minor box lacrosse talent in Canada was on display last week as the nationals began in two cities. Team First Nations’ (TFN) three squads of laxers traveled to the Canadian Lacrosse Association’s trio of national championships in Whitby, Ontario and Saskatoon, with all three teams leaving with medals, though none could win the ever-elusive gold. The youngest TFN squad is laden with Kahnawake talent and was in Whitby for games that started August 1, and wrapped Saturday. The TFN Peewees were dominant in the first half of group play before falling to powerhouse Ontario Wednesday, and then losing to a tough BC team Thursday morning. In the playoff round, however, TFN regrouped and got revenge on BC, winning 5-4 Friday morning at the Iroquois Pad to book a date in the finals. Any guesses of who was in the final? Anyone who didn’t say Ontario has not been paying attention to lax in Canada for the last decade. Saturday afternoon the TFN boys ran with Ontario for most of the game, but Ontario’s shooters again proved too much, and Ontario won 9-3. Silver medal finish aside, the coaches and players know the Peewee team has a ton of talent that could turn heads in years to come. The big question is always, how to top Ontario? “We need to step up our programs if we want to compete with Team Ontario because their kids are on another level,” said Stacey. Ontario naturally has a larger talent pool to choose from, and Stacey said TFN could use sponsors or fundraising earlier to help some players make the tournament, who may not be able to afford it. Coaches, players and managers will have a year to work on getting to that next level if they hope to dethrone the champs. TFN’s Bantam team was in Saskatchewan and booked the worst date in the first round of the playoffs imaginable when the boys in silver and purple were forced to take on Ontario Friday at noon. TFN lost a critical group stage game against BC that meant BC played Alberta and TFN played Ontario in the semis. High noon proved a fatal hour for TFN’s defence as the shooting gallery opened early, and Ontario peppered TFN goalie Jacob Cornelius’ net with shot after shot. TFN’s offence couldn’t get moving and Ontario won 9-0. “I think everyone knew that when we played Ontario what the score was going to be and everyone was kind of scared to play them because of their record,” said TFN forward Koleton Marquis from Kahnawake. The bronze-medal game gave TFN a chance at vengeance against BC, providing some silver lining to the disappointing elimination round seeding. Kaleb Benedict, Isaac Squire Hill and James Gowland scored in the first frame giving TFN the 3-0 lead, and Richie Albert made it four to start the second. BC stormed back with three unanswered, but Dalton Thomas scored with five left in the second to retake the two-goal cushion. TFN held on in the third and won 8-5 to claim the bronze. Teharoniorens McComber had an assist in four games for TFN, and Marquis scored three goals and added three assists in seven games. Ontario thumped Alberta 13-1 for the gold. Marquis was happy to see the team grow in such a short period of time at the tournament. After a quality group stage from TFN’s Midget team, the elimination round began last Friday against Nova Scotia. TFN made quick work of the up-and-coming Eastern side, winning 7-4, setting up a date with – surprise, surprise – Ontario in the final game. Ontario’s dominance continued at the Midget level, and TFN fell 10-2, good enough for silver. McComber made no excuses for his team’s performance and gave credit to the well-oiled Ontario machine. He coached his team to win the gold like he did in 2009, and was upset to see his team unable to control the middle of the floor. McComber knows what is needed to beat Ontario, and hopes future TFN teams will learn what Ontario knows. The coach has been in the game a long time, and tried this season to instill a sense of pride and purpose in his team when playing for a national championship, an event not easy to come by in any level of lacrosse.